Dandelion (Taraxacum officinale) is one of the top three most prescribed digestive and liver herbs in my dispensary, the other two are milk thistle (Silybum marianum) and globe artichoke (Cynara scolymus). 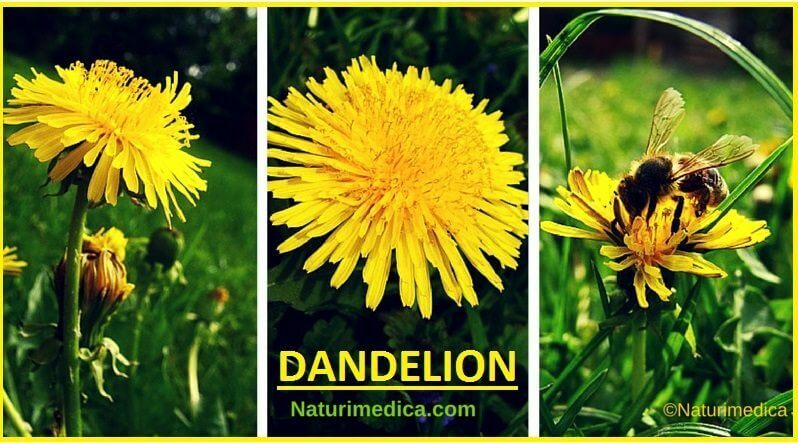 I prescribe dandelion in many forms (herbal extract, tea or leaves) either on its own or in herbal mixes, with great clinical results. The dandelion plant is one of the world’s most common and recognisable herbs, although it’s also considered by some as a persistent weed due to its robust nature and the ability to grow almost anywhere. The herb is thought to have originated in Central Asia and nowadays it’s widespread throughout the world where it’s known by many different names including lion’s tooth and wild endive. This cheery plant has beautiful bright golden yellow flowers that bloom from early spring well into autumn covering meadows, lawns, roadside patches of grass and just about any place with a bit of soil! Dandelion is a versatile herb that has high nutritious value and all parts of the dandelion plant can be used either as food or medicine. The flowers and leaves can be eaten fresh or dried; the dried root is used in herbal tinctures, as tea or roasted and used as a coffee substitute; and the white juice from the stem has been used for centuries as an effective topical wart treatment. I often recommend having dandelion tea /coffee as an everyday beverage to support the liver and the digestive tract. It can be included in your daily water intake and many people are able to drink and enjoy more of the dandelion brew than just plain water. Regular consumption will enable you to gently cleanse the liver on a daily basis lessening and/ or preventing accumulation of toxins from food additives/ preservatives and other chemicals and pesticides we ingest, environmental pollutants from the air as well as personal care products we apply to the skin. They all are processed and detoxified by the liver. Digestion – dandelion is a bitter tonic that stimulates digestion as well as mild laxative and stool softener helping with constipation. The bitter taste comes from the mineral sulphur which is essential for protein synthesis, liver detoxification, enzyme activity, healthy skin, hair and nails. The root also supports gut flora as it contains constituents such as inulin that act as a prebiotic i.e. the food for the beneficial bacteria in the gut. The herb supports detoxification and cleansing of the digestive tract from the effects of over consumption of fatty foods, coffee and medications. 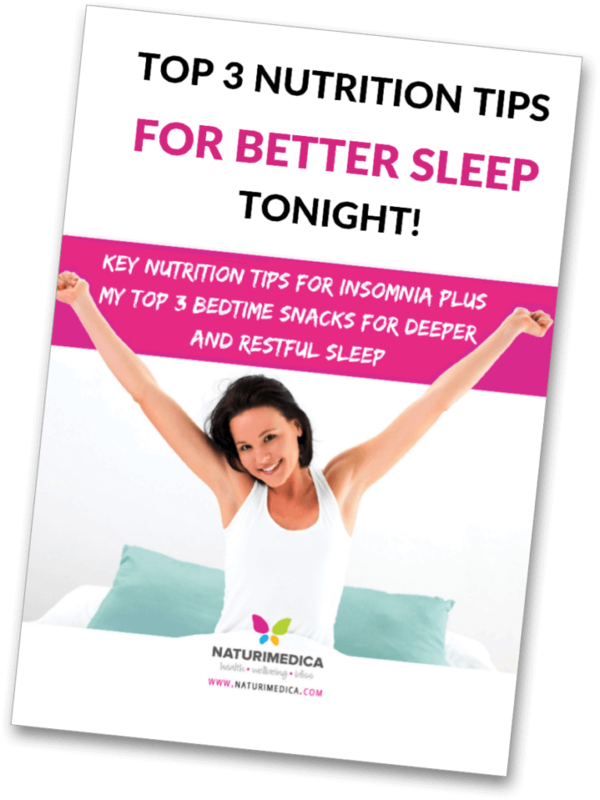 It works very well with another digestive and liver herb, milk thistle, helping to gently move the toxins out of the body. Diuretic action – dandelion leaves are one of the best natural sources of potassium and are well-known for their diuretic action (i.e. increasing the flow of urine). The herb has been used as a diuretic for centuries to treat water retention (oedema), lymphatic swellings, kidney stones and obesity. Blood pressure lowering – dandelion’s diuretic action cleanses the kidneys and lowers high blood pressure. Potassium present in dandelion helps to lower sodium which is known to be the cause of high blood pressure in some individuals. Skin and hormonal balance – regular ingesting of dandelion tea/ coffee is beneficial for acne and skin problems due to hormonal imbalances related to impaired liver function. Blood cleansing ability – the herb helps with clearing eczema, psoriasis, rashes, abscesses and swollen painful joints. Breast milk production and nursing – consumption of dandelion increases the flow of mother’s milk and improves nursing. High mineral and vitamin content – dandelion is rich in many vitamins including A, B complex and C, and minerals including iron, potassium, calcium, magnesium and zinc. The leaves are especially are high in iron and potassium. Warts (topically) – the milky sap from the dandelion’s stem is a well-known and effective remedy for removing warts. Rub a little of the sap on a wart several times a day until it begin to shrivel and vanish. Leaves – leaves are best eaten in early spring before the flowers appear as they become quite bitter and unpalatable once the flower has developed. The fresh young leaves of dandelion can be added to green salads, stir-fries, soups and smoothies. As mentioned above, the leaves are a great source of valuable vitamins and minerals. To make dandelion leaf tea, add boiling water to a small handful of fresh dandelion leaves, let stand for 10 minutes and drink with a little raw honey to improve the taste. Flowers – they are quite tasty and can be added to salads to enhance the nutritional content and make the salad more appealing. They can also be added to wine and steeped for about 2 weeks into a wonderful dandelion wine. The flowers can also be soaked in vinegar and used for salad dressings. Roots – the dried roots can be steeped into a tea, or roasted and ground to be made into a herbal coffee either alone, or combined with roasted chicory root for a more full-bodied flavour. How to make dandelion coffee for daily consumption: take 1 tsp of roasted dandelion root, a small piece of cinnamon stick plus a few cloves. Put all ingredients into a small tea pot or a mug, add boiling water. Steep for 10-15 minutes to extract the therapeutic ingredients from the root. The longer the coffee is brewed the more bitter it becomes. 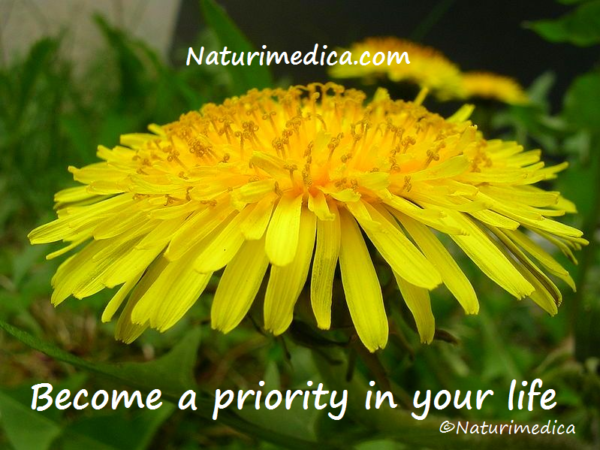 Here is my photo of a beautiful dandelion flower with an important message for you: Take a good care of yourself! Overall dandelion is recognised as a safe herb with little side effects other than rare allergic reaction, and is approved as food flavouring in Europe. Based on dandelion’s effect on bile secretion, Germany’s Commission E has recommended that it not be used by individuals with obstruction of the bile ducts or other diseases of the gall bladder, and be used only under supervision of a health practitioner by those with gallstones. In cases of gastric ulcer or gastritis, the herb should be used with caution, as it may potentially cause hyperacidity. People with known allergies to plants from the same family (Asteraceae) such as chamomile and yarrow should use dandelion with caution. Dandelion has been known to cause allergic contact dermatitis due to the presence of certain components such as terpenes. Due to the diuretic effect of dandelion leaves it should be used with caution by those taking prescription diuretic drugs. It should be used with caution by those taking medications with a narrow therapeutic window including lithium, insulin or other medications that reduce blood sugar levels. I hope that after reading this post you may develop a new appreciation for the humble dandelion! At the very least consider adding dandelion tea/ coffee to your beverages of choice and enjoy the many benefits of it more often. Do you have any information on the rare allergic reaction? I ate some greens yesterday and today I am covered in a hive-ey rash. Not sure if it’s related or not. I haven’t heard about dandelion greens causing an allergic reaction before, but I guess it’s possible. They might’ve been sprayed with something causing the skin reaction. Thank you so much for another super-informative and interesting article. Dandelion is one of my favorite herbs and I enjoyed fresh leaves and flowers during the spring & summer. If the meadow is trimmed regularly, you can have a steady supply of young leaves 😉 Not to mention they are even more nutritious than spinach or Swiss chard! I also made big batches of both root & leaves tinctures. While roots are mainly responsible for the liver and gallbladder-cleansing action, leaves have a more pronounced diuretic effect. Yes, both roots and leaves have therapeutic uses and having a fresh supply nearby helps very much! Don’t know about the best time to roast the roots, I’m afraid. 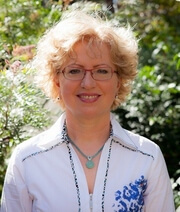 I learned some new things i did not know before about dandelion root and liver and skin health. awesome. natural herbal medicine is exciting. Thank you for your feedback. Dandelion coffee with cinnamon and cloves rocks!